Stirling’s New County Jail, built to replace the wretched Tolbooth, across the street, was opened in 1847. Various Psychics and Mediums visiting the Jail reported odd experiences, here – though, surprisingly, it has NO ghost stories connected to it. The first 5-Star visitor attraction in Stirling, it closed in 2012 - but the collaboration of the Stirling GhostWalk's David Kinnaird and Geoff Morrison of Destination Stirling/Scottish City Pass (and the assistance of many local organisations - including Creative Stirling, the Smith Art Gallery and Museum, Historic Scotland and Stirling Electrical) has ensured that regular performance tours have recommenced each Easter and summer-season since 2015. 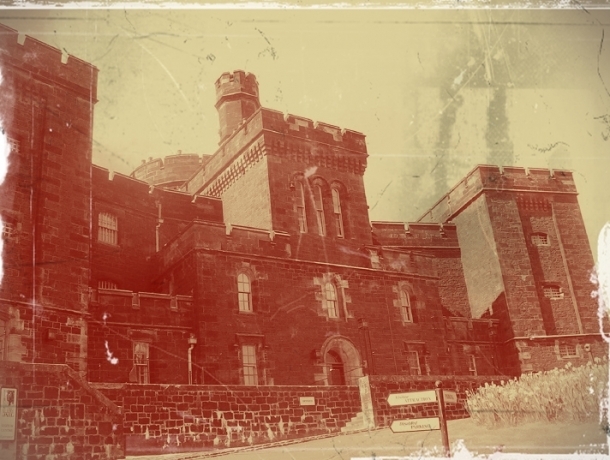 The Jail closed for the summer-season on 9th September 2018 - but will reopen for special shows at Hallowe'en/Mid-Term Break, in October! The building is currently home to the VisitScotland Visitor Information Centre, Destination Stirling and Creative Stirling.